I’ll be honest, I wasn’t expecting great things when I sat down in the theatre onboard a Cunard cruise to watch a ‘comedy juggler’. It was the last night of my cruise and the rest of the entertainment had been dull at best. I was expecting it to be equally boring but Johns performance proved me wrong. It was the best entertainment on the ship by a million miles. I have no idea how John managed to juggle the things that he did. Balls, batons, rings, rackets and knives. All in weird and wonderful ways which made crazy patterns in the air. There was a lot of variety in the show in the way that each trick was performed. An element of audience participation was involved which normally has me running for the door! But John was friendly and only engaged with the audience members who wanted to be part of the show (much appreciated). John was genuinely funny and witty, I laughed a lot during the show and definitely would recommend it to anybody. 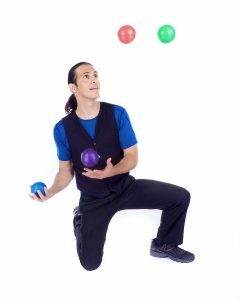 Everybody loves juggling, from children to the elderly. Maybe that’s why it’s a perfect show for a cruise. Anyway, I thoroughly enjoyed the show.